If you are invited to an Indian wedding and you’ve never been to one, deciding what to wear and how to wear can become a challenging task! This blog post is written from a perspective of a foreigner who went through these challenges herself and wants to share experience with other foreign guests, who know little about Indian clothing. When I first went to an Indian Bazaar in Delhi almost 10 years ago I had only one thing on my mind: “Sari!” So, I bought a 6 meter long piece of a beautiful silk in cream with a maroon border, brought it to Moscow, locked it in my closet and never took it out again. It was only 5 years later that I was invited to the first Indian wedding in my live and remembered that I had a ready (as I thought at that time) outfit to wear. However, when I brought the sari with me to India a shy smile on my friend’s face told me that something was wrong – you see, sari is not just a one long piece of beautiful material which you simply wrap around your body (how I’d thought), there are two more pieces to it, and a shop keeper happened to forget to educate me about it. I could not wear my sari on that day and since then I discovered that there are much more options for a wedding guest outfit, many of which you can wear even outside a traditional wedding ceremony and look beautiful and appropriate. Here is a short and simple, but useful digest for those who are going to an Indian wedding what and how to wear for an Indian wedding – with no history, but a lot of practical information! Despite an obvious complexity of a “wrapping art” sari will always remain the choice number one. Sari consists of a long piece of material (usually 4.5-8 meters long, and around 1 meter broad), a blouse and a petticoat (a type of a cotton skirt which you put under your sari and wrap the sari around it). Often a tastefully chosen blouse is a secret to a gorgeous sari, as you can apply your fantasy to its decoration and colors combination. Usually a blouse is stitched to fit by a tailor, but nowadays it is also possible to order it online, you just need to provide the right measurements. Advantages: Sari is unbelievably feminine (and I find it even very seductive, in an elegant way), and a variety of combinations of colors and patterns will never stop surprising you. Besides, it is THE traditional wear and you will see most Indian ladies wearing saris during the actual wedding ceremonies. You might also not find any other occasion in your life to wear such an exquisite piece and it could become a beautiful experience on its own. Disadvantages: Even if you watch YouTube videos for 500 times it will not teach you how to wear a sari properly, as a skill can only be acquired with practice. Most likely you will need help with putting it on, and during a busy wedding, especially with numerous foreign guests who need help, it might become slightly hectic and you might not have it wrapped in a way you’d like it to look (it happened to me before). Walking comfortably and dancing in a sari can also become a real challenge, as such an amount of clothes is not easy to handle. Cotton is a rather hard material and can be tough to manage and wrap properly – I would not recommend to go for a cotton sari for the first time. There is silk of so many types available that it is difficult to generalize. However often you will come across silk saris from a thick material (raw silk), like the one in the picture. It is always a big pleasure to wear high-quality materials, however it can look a little “bulky” on you and it is very difficult to wrap it in an elegant way. If a wedding is going to take place during a hot season it can also be quite challenging because of heat – these kind of saris are by no means light. Speaking about advantages of this kind of material: this kind of saris do look very classy and are not very revealing if you don’t feel like showing your belly. Chiffon or georgette is the best material for younger ladies who are also eager to opt for more revealing styles. It fits a figure perfectly and it is very easy and light to wear. In fact it is so light that you might have little difficulties even dancing in it (if you learn how to handle a “hanging” piece of a sari, of course, and if you have no difficulties with narrow long skirts). However, if you are not too comfortable with showing too much skin you might like to stay away form net saris and go for something more conservative. How to wear: There are numerous styles to wear a sari, depending on the province, fashion and simply individual taste – a sari was wrapped around me many times by different people and it never looked the same. To fit it in a desired way you need to use pins. It is important to remember that it is vital to wear a perfectly fitting blouse – so do make sure that you take the right measurements before sending them to a tailor or to an online shop if you are buying remotely. Here you can see some of the beautiful ways of wearing a sari, and here is a nice instructional detailed video about how to wear a sari (it covers only one style of wearing a sari though). Lastly, here you can watch a useful video about how to take the right measurements for your sari blouse. Lehenga is a dress which basically consists of a long skirt (lehenga), a blouse (choli) and a shawl (dupatta) which you can use to either cover your belly and back, or to cover your head (or both). Lehenga is a common choice for parties and less formal occasions than a ceremony itself. Advantages: It does look gorgeous and by no means does it look less feminine than a sari. You will not need any help to wear it and you can easily move in it around and even dance despite the length as it is simply not that narrow and it doesn’t hold on pins. You can also wear a blouse and a skirt separately later in different circumstances. Disadvantages: in my opinion there are no real disadvantages to lehengas unless you are really uncomfortable with showing your belly and your back – as this can not be avoided. Which material to chose: both silk and chiffon work wonderfully for a lehenga – usually a choice would depend purely on colors combination and a skirt style. How to wear: you wear it in the same way as you would wear any other skirt and a blouse – no complications like with a sari. A duppatta would be fixed by pins if you prefer to have it on. Salwar Kameez is a dress which you will see the most in India, especially on younger girls. It consists of a tunic (usually cotton or silk), and cotton pants, either extremely tight or extremely wide. I believe that a cotton Salwar Kameez is the most comfortable wear you can imagine, especially when the weather is hot and you want to look feminine but yet be dressed in a rather conservative way. This type of dress is also a wonderful option not for a wedding ceremony itself, but at least for one of the pre-wedding functions, especially if they take place during the day. Advantages: it is extremely comfortable, and you will have plenty of reasons to wear it again even outside India, especially in the heat. Disadvantage: there are no real disadvantages – it is rather a matter of taste. Even though Churidar Suit is, strictly speaking, also a type of salwar kameez, I put it in a different category for a reason. 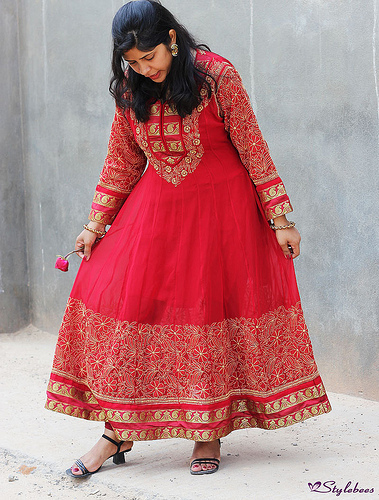 It does look like a dress with embroidery which can be either till you knee or slightly lower in length, and it usually comes with tight cotton pants and a dupatta. This kind of dress looks gorgeous in silk, as well as in chiffon and georgette. Advantages: it is very comfortable and easy to wear , and it might be the most familiar piece of clothes for those who are not used to traditional festive Indian wear. Moreover if you don’t feel comfortable about showing your belly or back, it is indeed the best choice for a wedding ceremony. Disadvantage: the only disadvantage I can think of is that it really looks very different from a sari, if you have always dreamt of wearing one (lehenga can do the trick though!). Any color and color combination would be appropriate, however, try to avoid purely black and white colors, and always opt for something more colorful and festive. Update: I was corrected that white can be considered an appropriate color in some provinces – just make sure you check with a host! It is very common for modern Indian weddings that men simply wear a normal Western suit, even grooms themselves. If you still decide to opt for something rather traditional, there is a choice of Kurtas Pijamas (a tunic with pans) or sherwani (in the picture), made either out of cotton or silk, in which you might feel much more comfortable, especially if the weather is hot. Just make sure that it fits you properly! If you have more experience or insights to share, please do it in the comments!